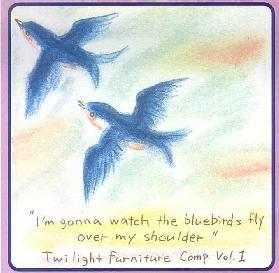 Various Artists - "I'm Gonna Watch The Bluebirds Fly Over My Shoulder: Twilight Furniture Comp. Vol 1"
I’m Going to Watch the Bluebirds Fly Over My Shoulder is a lovingly compiled selection of noisy pop/psych and eccentric psych/folk tunes. Orange Cakemix checks in with 4 tracks scattered throughout the compilation, including the blissed-out fuzz pop of Dead Leaves of November, the tranquil and beautiful instrumental Memory of the Sea Part 2, the upbeat acoustic pop of Breeze (which reminded me of a little of some of the mellower stuff from Love’s classic 60’s Forever Changes album), and the breezy slide guitar folk rock of Art Deco Clown. Momus, Where Are You? by The Smittens is a magical little track of strumming acoustic guitar and female and male (harmony) vocals, with a nice little bit of psychedelic organ and hip, pop culture lyrics. They turn up the energy for their other contribution, Gentlefication Now!, a catchy sing-along pub folk tune, which would be a little repetitive if not for it’s less than two minute length. The Knit Separates offers up three lo-fi tracks of melancholy 80’s tinged music, including the jangly, full of noise tune The Sorrow That Owns You; the simple, melodic folk (with very weird vocals) of Every Single Girl in the World; and the acoustic pop with cymbal crashes of Loveless Solitude. The Twin Atlas gives us Sleep in Late, Laugh All Night, a laidback bit of folk music with nice slide guitar bits, and the mellow, happy, and trippy Dog With Feathered Wings. Two of the weirdest and spaciest (and hence, among my favorite) tracks come from Zenith 33. Blink is an instrumental full of different shades of sound, set to some backwards-tracked percussion. California Rising is otherworldly space folk, with swirling electronics, plucky acoustic strumming and a quietly thoughtful electric guitar lead. Would have liked if this one was longer than it’s 1 minute and 54 seconds! The Hi Fi Envelope contribute two instrumentals, the gentle, memory haunted Homecoming and the lovely acoustic and slightly experimental (with weird use of samples) I Want to Talk to My Sister. Other tracks include Colin Clary and the Magogs’ excellent, bouncy and spacy 60’s influenced psych rock pop track Chiclets in a Frame, the faraway, lo-fi cry of Around the World in 80 Days by The Red’s, Pinks, and Purples, the pastoral and dreamy The Last Boardwalk by The Youth Souvenir, and the urgent folk rock of Scarves and Sleeves, with a nice mix of harmonizing male and female vocals by The Single Tear. Rounding things off is All Flesh is Grass, a distorted, charmingly off-kilter and psychedelic offering from Zelium Quong. There are no extended freakouts here; the songs range in length from just under a minute and a half to a little over 3 minutes. Intimate, accessible, yet just weird enough to make you smile, I’m Going to Watch the Bluebirds Fly Over My Shoulder is perfect listening for a lazy, summery Sunday afternoon with your favourite person or pet by your side. For more information you can visit the North Of January web site at: http://www.northofjanuary.com.